Are Reciprocating Saw Blades Universal / Interchangeable? Yes, reciprocating saw blades have a universal shank that is standardized to fit all reciprocating saws. 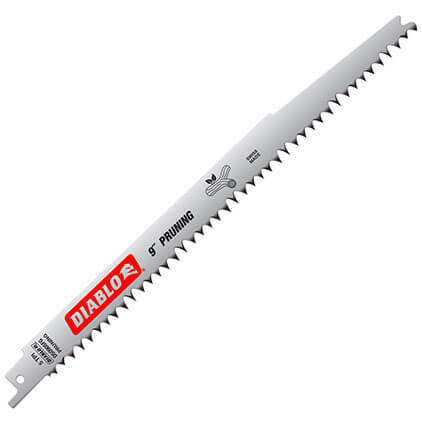 What are the best sawzall blades for metal? What are the different reciprocating saw blade types? 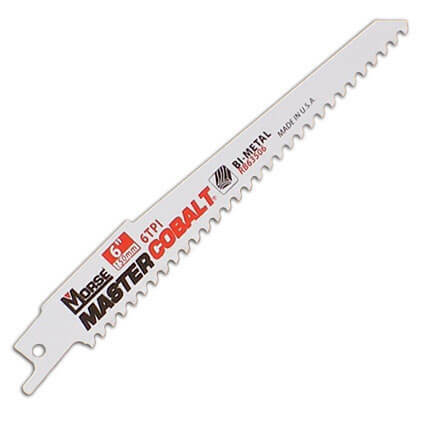 What are the best reciprocating saw blades for wood? Who are the different saw blade manufacturers? 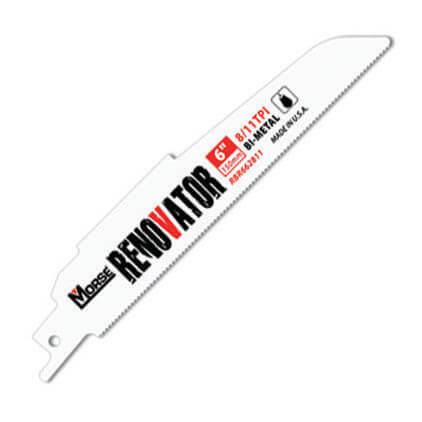 What is the right sawzall blade for fiberglass? 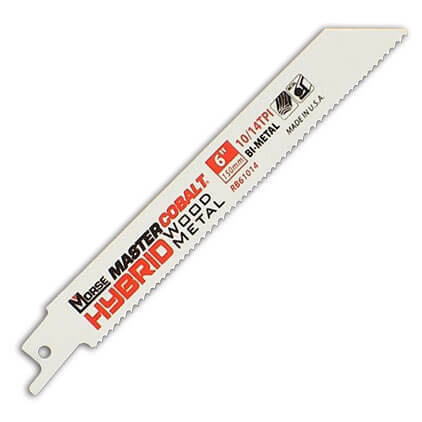 What is the best sawzall blade for hardened steel? 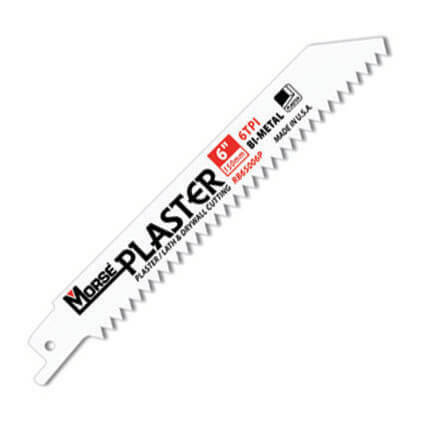 Do I need special plaster sawzall blades? 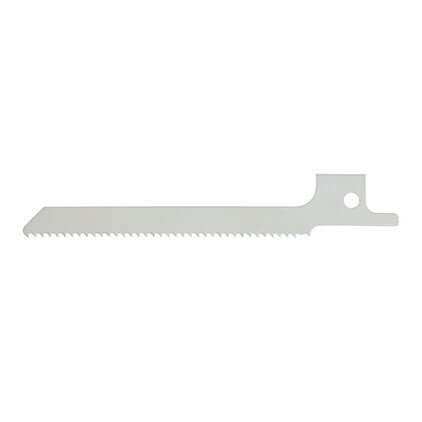 Do I need a special PVC sawzall blade? For cutting PVC pipe, use a combination wood/metal blade with a 10/14 TPI configuration. There is no specialty PVC sawzall blade, nor is one necessary. 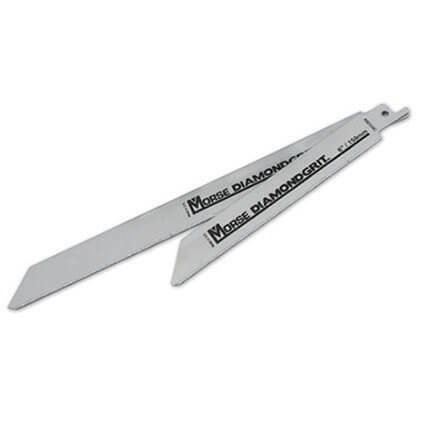 A specially designed plaster blade with triangular shaped teeth for cutting in both directions performs best. A second choice would be an 8% cobalt wood cutting blade with a tapered pointed end. Reciprocating saws are one of the most versatile tools available. Part of that versatility comes from the vast array of blades available for cutting through a wide range of materials. With the right blade, your sawzall can cut through wood, nails, fiberglass, branches, plaster, masonry, and metals including aluminum, cast iron, steel, and even high-strength alloys. But how do you choose the proper blade for the material you need to cut? There are many blade characteristics to consider. In general, this includes the blade material, length, width, thickness, and teeth-per-inch (TPI). For specific cut types, blade shape, tooth shape, kerf-width, gullet, and tooth pattern can be selected. Even though there are many options, choosing the right reciprocating saw blade is easy once you know the basics. Carbon steel blades are the most inexpensive type, and also the most common. They are the softest of the blade materials and tend to be more flexible to allow bending without breaking in the proper application. That also makes them the least durable. They are good for cutting softer wood, particle board, and plastics. However, they quickly become dull when used on hard woods, metal, and other hard materials. High-speed steel blades are subjected to a tempering process that makes them more heat-resistant and durable than their carbon steel counterparts. They last up to 5 times longer than carbon steel. That hardness makes them less flexible and thus more prone to breaking when bent. It also allows them to cut hardwoods, aluminum, and non-ferrous metal without excessive wear, dulling, and tooth breakage. Bi-metal blades combine a high-carbon steel body for flexibility and break-resistance, and high-speed steel teeth for heat-resistance, hardness, and durability. On average, Bi-metal recip blades will last 10 times longer than a carbon steel blade. While the cost slightly more than HSS or HCS blades, they offer the versatility and toughness for more demanding applications. This makes them the most popular blade type among people in the trades, auto yards, and other professions where sawzalls see frequent or daily use. We also recommend bi-metal blades for DIY projects and occasional use because of their durability and long life. Other bi-metal blades use a cobalt-steel alloy cutting edge. This provides even greater heat-resistance, wear-resistance, and overall longer blade life. These blades are suitable for a range of jobs including demolition (nail-embedded wood), auto dismantling, sheet metal and pipe cutting, as well as standard wood cutting. Carbide tipped sawzall blades are also bi-metal blades, but with a carbide (tungsten carbide or titanium carbide) tip at the end of each tooth. These carbide materials are extremely hard, heat-resistant, and impact-resistant. They also offer 20 times the cutting life of a standard bi-metal blade. The can cut thicker pieces of metal including cast iron, stainless steel, and high-strength alloys. This makes them ideal for cutting metals that would almost immediately destroy a HCS, HSS, or traditional bi-metal blade, such as grade 8 bolts and boron reinforced auto pillars. Carbide grit blades (typically tungsten carbide) don't have teeth like a traditional sawzall blade. 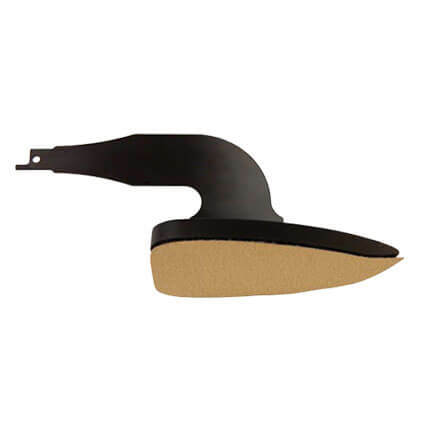 They have an abrasive strip that is used for cutting dense materials such as ceramic tile, cement, brick, marble, other stone and masonry, harder metals like cast iron, and fiberglass. The hardness of the carbide grit allows it to cut these materials without damaging them or wearing out prematurely. Diamond blades are also abrasive, but use diamonds instead of carbide. These are the most expensive reciprocating saw blades. They are used to cut concrete, glass, fiberglass, and ceramic, and can also cut fiber cement, cast iron, and masonry. The hardness of diamonds and fineness of the abrasive grit is necessary to cut brittle material like glass (that would be destroyed by a toothed blade) and very hard and dense material like concrete (that would destroy a toothed blade). Due to the hardness of diamonds, diamond grit blades have a much faster cut than carbide grit and last 5 to 20 times longer. When selecting a blade, remember this rule of thumb: The blade’s cutting edge must be harder than the material you are cutting. Reciprocating saw blade lengths range from 3" - 12". Standard lengths are 4”, 6”, 8”, 9” & 12”, with 6" and 9" being the most commonly sold. Short blades are more rigid and therefore more aggressive. That rigidity give you a straighter, more square cut, making them ideal for plunge cutting, copper pipe, and thinner metals. Longer blades are more flexible and can dissipate more heat since they have more surface area. Jobs like demolition, pruning, auto-dismantling, and rescue call for a longer blade. This flexibility also allows you to bend the blade when a flush cut is required. The blade length you choose should always be slightly longer than the thickness of the material you are cutting. This reduces slipping and binding, and allows you some freedom of movement. If you get a blade that is too long the end can wobble, sometimes violently. This causes intense vibration, slowing down your cut, and can ultimately damage your work and lead to a bent blade. Your blade length should always be 2" - 3" greater than the width of the material you are cutting. Wider blades offer more stability. They resist bending and vibration to provide straighter, more aggressive cuts. That extra support makes wider blades better for heavy duty applications such as demolition (nail-embedded wood), auto-dismantling, and fire & rescue. 3/4" - 1" are considered wide blades. Blades with a lower width provide more flexibility for general purpose use or finer cutting. These typically fall within the 1/2" - 3/4" range. Very low widths are less than 1/2" thick and are typically used for scroll cutting - curved shapes and detail work in wood, metal, and plastic. The blade's shape also makes a difference. Sloped shaped blades are better for plunge cutting. Straight blades are for edge cutting. Many blades have a notched or sloped tip, or a semi-tapered back, to make them able to perform both tasks adequately. Thicker blades are more durable and resist bending and vibration. They also allow a heavier feed pressure for tougher jobs. Heavy duty thicknesses of 0.050" - 0.062" are best for demolition through nail-embedded wood, auto-dismantling, fire & rescue, and cutting thicker or denser metals. Heavy duty blades are rigid and have a larger kerf width, so they are not recommended for applications where fine cutting or flexibility are required. 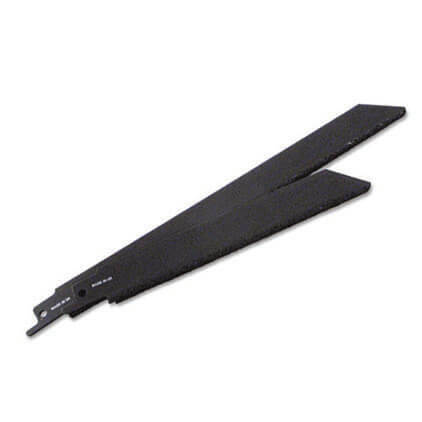 General purpose blades are typically 0.035" and are suitable for most applications. They are more flexible and provide a faster cut. They also tend to cost less because less material is used in their construction. Longer blades bend more easily. If that is not desired in your application, consider a thicker blade for lengths of 6" or greater. Reciprocating saw blades range from 3 - 24 TPI. The number of teeth per inch determines the cut speed and roughness of the cut. Lower TPI blades cut fast but leave rougher edges. Blades in the 3 - 11 TPI range are typically best for wood and demolition work. Pruning blades tend to be at the low end, and demolition/nail-eating blades tend to be around 8-11 TPI. General purpose wood cutting blades are in the middle, often around 6 TPI, and can also cut nails. Blades with higher TPI remove smaller amounts of material with each pass. Therefore they cut slower and leave a much smoother edge. Blades 12-18 TPI are typically used for metal and denser materials as well as finish cuts in wood. The 18-24 TPI range is almost always used for metal cutting. Always keep 3 teeth in contact with the material being cut. 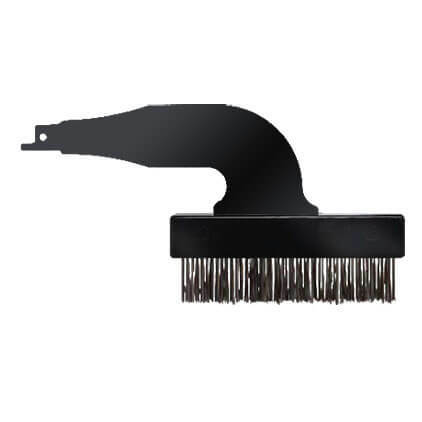 This reduces snagging, keeps the cut smooth, and helps you maintain control of the cut. Combination blades have a variable TPI and are often used for both wood and metal cutting, and demolition. Different areas of the blade have different TPI, allowing the user to change the cut based on how they position the blade. For example, a 10/14 TPI blade has alternating sections of 10 TPI and 14 TPI for cutting wood and metal. A variable 14/18 TPI blade is designed to chew through metal. High Carbon Steel - the softest of the blade materials. HCS blades are flexible to allow bending without breaking, which also makes them the least durable. They are best suited to cutting softer materials. High Speed Steel - subjected to a tempering process that makes them more heat-resistant and durable. They last up to 5 times longer than HCS blades. Combination of a high-carbon steel body for flexibility and break-resistance, and high-speed steel or cobalt-steel alloy cutting edge for heat-resistance, hardness, and durability. Bi-metal blades with a carbide (tungsten carbide or titanium carbide) tip at the end of each tooth. Carbide materials are extremely hard, heat-resistant, and impact-resistant. They are used to cut thicker pieces of metal including cast iron, stainless steel, and high-strength alloys. Blades with an abrasive strip of tungsten carbide grit instead of metal teeth. These blades are often used for cutting dense materials such as ceramic tile, cement, brick, stone, and masonry. Blades with an abrasive strip of diamond grit instead of metal teeth. They are used to cut concrete, glass, fiberglass, and ceramic, and can also cut fiber cement, cast iron, and masonry. Also listed as "kerf width", this is the width of the cut made by the blade. It is determined by the tooth set and width. The spacing between the blade's teeth. Since the gullet size determines the amount of material removal, it is typically proportional to the tooth size. In general, as the number of teeth per inch increases, the tooth size decreases. Therefore the gullet size also decreases because less material must be removed per blade pass. The configuration of the teeth on a saw blade. A repeating 3 tooth pattern consisting of one tooth that is angled outward to the right, another to the left, and the third tooth straight. These blades are more aggressive, have a wider kerf, and cut faster than wavy set teeth. They are better for contour cutting, wood, and framing. A consistent tooth pattern with a groups of teeth set to one side or the other, separated by a group of unset teeth. If you look at the bottom of the blade with the teeth facing you, they would appear in a wavy pattern. Wavy set blades are suitable for use in all types of materials and have a smaller kerf width than raker set teeth. "Pitch" is another way of saying teeth per inch. Variable pitch simply means a variable number of teeth per inch, such as those found in wood/metal combination blades and some demolition blades. The angle of the blade's teeth relative to the horizontal position of the blade. Cutting a shape out of your material, usually a rectangle or circle, and often starting with a plunge cut. A slot cut directly into the material - not from the edge - without drilling a pilot hole. The best sawzall blades for wood have a more aggressive tooth pitch of 6-10 TPI that can easily cut though nail embedded wood, 6"x 6" posts, and small tree limbs. A combination blade with 5/8 TPI or 10/14 also works on wood. The blade can vary from 6" to 12" in length. It's a good rule of thumb that as you go up in length you should also also go up in thickness to reduce the chance of bending the blade. For example, a 6" 6 TPI .035 blade would work well. A 9" blade should be thicker to resist bending, so a .042 or .050 would be preferable. With a 12” blade, .050 or .062 would be a good choice. For the best brand of wood cutting blade, we think MK Morse takes the prize. In general, the best sawzall blades for cutting metal have a higher TPI (Teeth Per Inch) and are bi-metal or carbide tipped. 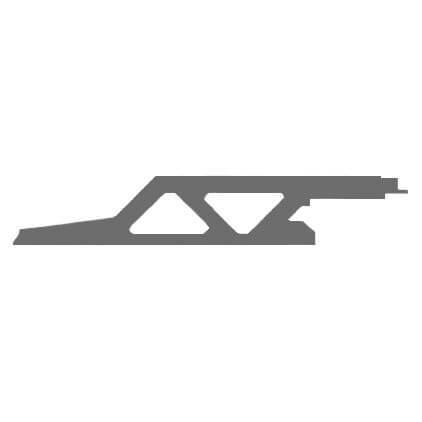 The right TPI and blade material depend on the type of metal being cut and its thickness. Cutting thinner metals, including sheet metal, requires a finer cut. Use 18-24 TPI bi-metal blades. For thicker metals such as steel pipe, angle irons, or tubing, use 14-18 TPI bi-metal blades. 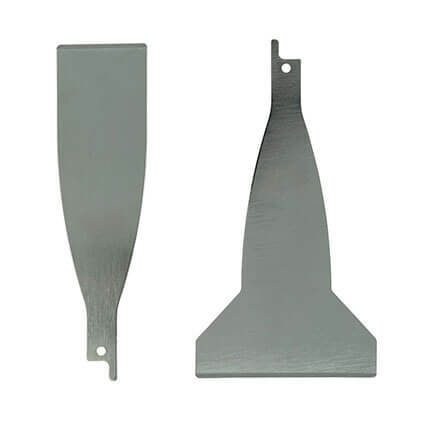 For aluminum, an 8-10 TPI blade is best. As far as the best brand of metal cutting blade, we like MK Morse. If you are cutting cast iron, stainless steel, and high-strength alloys, or for jobs like auto dismantling and fire & rescue, look for a carbide-tipped blade that is at least 8 TPI. 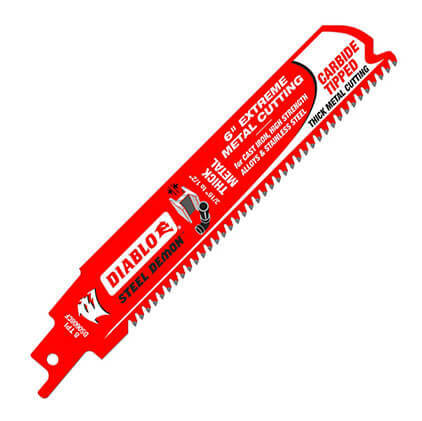 If you're in the market for a carbide-tipped blade, go with the Diablo Steel Demon Carbide Tipped - it can cut through almost anything. Cutting metal with any blade will generate heat. A thicker, longer blade will last longer due to the metal mass absorbing and dissipating more heat. Running the saw at lower speeds will reduce heat buildup. If possible when getting the cut started, moving the saw back and forth along the cutting edge of the blade will help dissipate the heat by allowing the full length of teeth to be used. If your application permits, you can also use lubricant to reduce friction and heat. 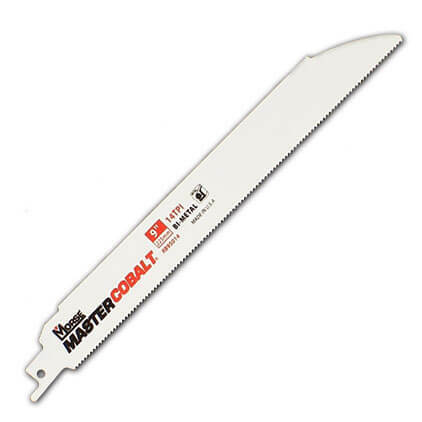 Our best performing, longest lasting metal cutting sawzall blade is the Morse Master Cobalt 9” .050 thickness 14 TPI (teeth per inch) that cuts mild steel, stainless steel, and aluminum. There are many reciprocating saw blade types for cutting a variety of materials. The main differences are in teeth per inch (TPI), blade material, and/or blade shape. Wood Cutting Blades normally have 5 to 10 TPI and are best for cutting most types of wood, branches, and softer materials. They will also cut nails. Demolition Blades are best for nail-embedded wood. They are thicker for heavier duty applications and range from 6 to 11 TPI. You will often see demo blades with variable TPI to better cut the range of materials encountered in a demolition job. Combination Blades also use a variable pitch tooth configuration such as 8/11 TPI or 10/14 TPI. These blades cut both wood and metal. They are good choices for many jobs because they cut a wide variety of materials. Metal Cutting Blades have more teeth per inch for cutting harder, denser materials. They are typically 10 to 18 TPI, but can go as high as 24 TPI. They are also used for finish cuts in wood because they leave a smooth edge. Carbide Tipped Blades are for cutting very hard or dense materials such as high-strength alloys, cast iron, and stainless steel. Even though they are commonly 8 TPI, the ultra-hard and durable carbide tip allows them to cut materials that destroy other blades. Carbide Grit Blades don't have teeth - they have a grit surface used primarily for cutting tile and masonry. There are a number of specialty blades for specific applications. Carbide tipped blades cut harder, denser metals like hardened steel, cast iron, alloys including boron steel, and higher grades of stainless steel. These blades are extremely hard, heat-resistant, and impact-resistant. They are typically 8 TPI. 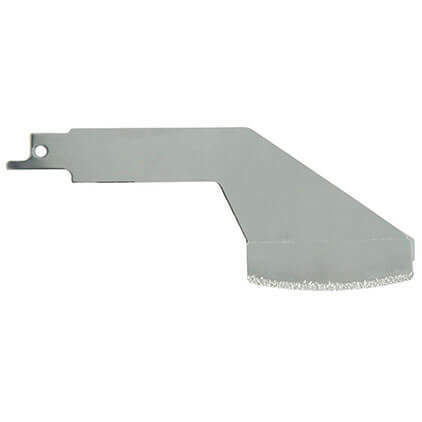 Diamond Grit blades also cut hardened steel, however they are expensive and take longer to cut through the material. When choosing the right sawzall blade for fiberglass, the abrasive characteristics of fiberglass should be considered. Because of the abrasive quality of fiberglass, a carbide grit or a carbide tipped blade performs well. We also have customers that do well using our standard MK Morse 14 TPI metal cutting blade. There are quite a few reciprocating saw blade brands. Below is a partial list. We stock MK Morse, Diablo, and Avanti.